The way London works has changed. In recent years, a new workforce has emerged – itinerant freelancers, ready to unfold the laptop and work anywhere; small creative businesses of dispersed remote-workers; and energetic start-ups who need office space can’t spare the overheads for conventional tenancy contracts. To accommodate this paradigm shift, branded co-working spaces aimed at creative companies and individuals are springing up around the city. One of the most trailblazing of these is Uncommon. With outposts in Highbury & Islington and Borough, it has barely been on the scene for a year, but is already leading the field. The Highbury branch came first. It began as a temporary co-working space set up in a converted warehouse to fill the time while it was waiting to be converted into apartments, but soon built up such a determined following of neighbourhood creative workers that it became a permanent fixture – and the foundation of London’s hottest co-working office brand. Today, it provides flexible membership options for individual creatives in search of inspiring space to work, as well as fixed office spaces for companies sized anywhere between two and 250 people. Uncommon’s recipe for success is an inspired mix of contemporary-cool design and near-obsessive attention to sensory detail. The team behind the brand are passionately devoted to the art of space-making, and they have cultivated a meticulously researched understanding of the psychology of engagement, focus and motivation. That research is made manifest everywhere in the building: in the abundance of natural light and plant life (proven to improve mood and productivity); in the mind-centring, botanically inclined interior palette; in the scented air; and even in the seating (Uncommon’s research identified eight distinct types of chair were needed to suit every body type or working style and ensured it provided every one of them). Sound is of course an integral part of this sensory landscape. Get the music wrong in a workspace and you can easily throw someone off their flow; get it wrong in a membership-based co-working collective, and you not only risk damaging productivity, but losing brand capital, members and money too. With what comes out of the speakers putting so much at stake, Uncommon asked us for help. This was Music Concierge’s first project that demanded concentrated workspace music, and posed a fascinating and enjoyable challenge. As anyone who listens to music while they work will know, some tracks push themselves into the foreground, hijacking your brain and taking you away from the task in hand; others take a back seat, setting a mood and steering you towards a state of flow without demanding the attention of the conscious mind. 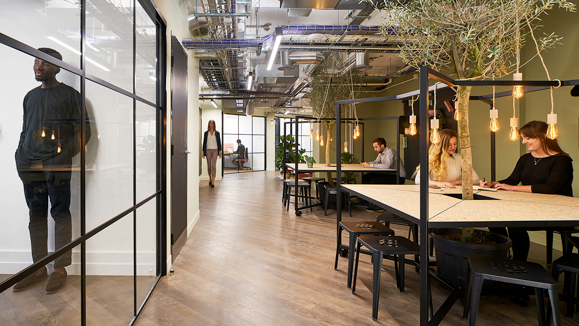 When it came to creating the sound for Uncommon’s fixed-desk co-working spaces, our challenge was to deliver an unceasing stream of the latter – taking into consideration the fact that, with many Uncommon members working there day after day, the tolerance for repetition would be even lower than usual. That meant creating a set of extensive playlists that could be frequently refreshed, and which contributed to a fun-but-focused atmosphere that energised and inspired those who worked within it. Uncommon also needed music for its coffee lounges, where at any given time its members might be working individually, having meetings or taking time out; and for its rooftop terrace in Borough, often used for after-work wind-downs and events. Each of these required a slightly different soundscape – from fresh and energising in the café to buzzy and upbeat on the roof – that had to be tailored as the mood evolved from the head-down-and-get-on-with-it ambience of Monday morning to the relax-and-kick-back vibe of Friday evening, but there was a common thread. In every area, the music has several jobs to do: to help members work better; to match the bright, modern and positive design of the space; to capture and express the unique and original identity of the Uncommon brand; to inspire loyalty in existing members and to sell the space to potential new ones. That’s a lot of boxes to tick, but we’re very proud to have ticked them. Across all areas, in both its current sites, Uncommon now has a sound every bit as suited to the needs of its diverse members as its chairs. If we ever need to move out of Music Concierge HQ, we know who we’d call first.